'Parkside' is a central (ground floor) 1 bedroom modernised flat, in a traditional Scottish tenement. Within 5mins walk of Scotland’s premier tourist hub, namely the Royal Mile/Holyrood Palace/Scottish Parliament/Arthur’s Seat area. A 5mins walk in the other direction takes you to London Road, a major bus nexus providing access to Princes Street (5mins), routes to the Old/New Town, the Royal Yacht (15mins) & Edinburgh Zoo (30mins) etc. The apartment has FREE WiFi/Parking & is 5mins away from shops. 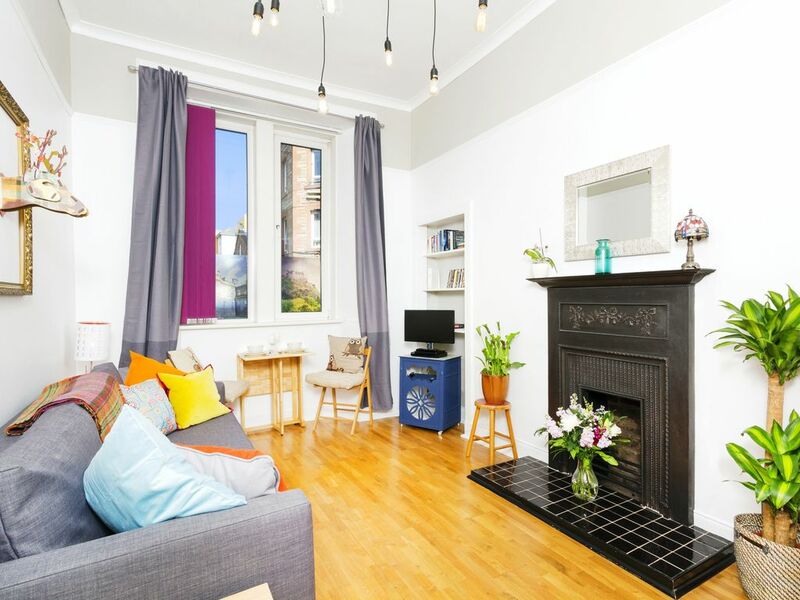 This central Edinburgh (see our map “photo”) apartment occupies a quiet position on the ground floor of a traditional Scottish tenement building, situated near the end of a peaceful cul-de-sac that provides pedestrian access to Holyrood Park. There is a Secure (buzzer) Entry System with an intercom providing additional security. The apartment comprises an attractive, bright, open plan living room / dining area which benefits from double glazing & (“Nest” controlled) central heating. It's a lovely open and comfortable living area with plenty of room to kick back and relax after a hard day out seeing the sights or attending a work event. The living room has a large sofa bed which pulls out very easily to form a good sized (6Ft 7') double bed. The modern kitchen is well provided with crockery, cutlery, glasses and kitchenware, a washer/dryer, dishwasher, fridge/freezer, oven and gas hob, microwave as well as heat, carbon monoxide & smoke detectors. In the vicinity there are a number of smaller shops as well as (5mins walk) the substantial Meadowbank shopping centre that includes a Sainsburys, TK Maxx and other high end outlets. However, for those that prefer to dine out, cosmopolitan Edinburgh is renowned for its large selection of restaurants, with a variety of restaurants / pubs close by. There is a spacious bedroom with a European King sized bed (6Ft 6' by 5Ft 2'), double wardrobe for storage and table & chairs to quietly relax in (the large window is double glazed). The shower room, with wash hand basin, has been recently modernised to a high standard. Off the hallway there is a toilet with a wash hand basin. Whenever possible, guests will be welcomed personally at the property for the handover of keys. As you would expect, crisp fresh linen, bath and hand towels are provided for guests. In addition, local information / literature, a USB charging point and a small selection of books, DVDs & board games have been provided for your perusal. Quite simply, the best of what Edinburgh has to offer is right on your door step as the apartment is located in the heart of the City (see our map “photo”). Scotland’s premier tourist hub, namely the World famous Royal Mile / Holyrood Palace (the Queen’s residence) / Scottish Parliament / Arthur’s Seat (set in a 650 acre park) area, is within a 5min walk, while a 3-5 min walk in the other direction takes you to London Road (a major bus nexus providing access to Princes Street in 5mins and routes to the Old/New Town, the Royal Yacht in c.15mins and Edinburgh Zoo in c.30mins etc). And, despite its central location, the apartment benefits from much sought after FREE WiFi & FREE on street parking! Without a doubt the apartment’s central location (beside Holyrood Palace & a 650 acre park), pedestrian access to the park, close to the main attractions and ready access to FREE parking has been a major draw. Nearby there is a major shopping centre (5mins walk), other shops / pubs / restaurants, numerous bus stops (including an airport / tour bus stop) and it’s close to the main train station (Edinburgh Waverley). In short, this apartment is a great base to make the most of your visit to Edinburgh! ................ I speak English; however please note that over the years I have found Google Translate very effective for assisting with queries & handling bookings in other languages. The shower room has a heated towel rail & wash hand basin and there is a separate WC room with heated towel rail & wash hand basin, both of which have been recently modernised. This is a ground floor flat. There is not an elevator/lift & one is not required! The dining table is situated in the Living room next to the window. There is seating for 4 & a chair mounted high chair is available. The apartment was just as described. Very clean, plenty of space for the 3 of us, and the perfect location for exploring Old Town portion of Edinburgh. All the essentials were provided and a few extra things like fresh milk and bread were stocked for us as well. Would definitely stay here again. I cannot recommend this property highly enough. The location is excellent with easy walking distance to the old town and numerous attractions. Thank you Eleanor - I hope to stay at Milton St again in the future. Nice apartment for two. Off street parking. Very clean with good bed linens. Kitchen well equipped plus small combo washing machine. Grocery store within .7 mile, easy walk. High Street .5 mile away. Royal Mile 1 mile. Edinburgh Castle 1.5 mile. Holyrood Castle .5 mile. We took the buses to the Royal Botanical Gardens. Excellent stay in a very cozy apartment! The apartment was just as advertised. Great location for exploring the park or the Royal Mile. We would definitely stay again. In addition to being close to the local attractions, a shopping center with a grocery store is a very close walk away. We stayed for a week and were very comfortable. We have traveled to Edinburgh many times, and we think this apartment is one of the best deals out there regarding accommodation and location. This space was perfect! Very comfortable and cute! We felt at home right away. Shopping is just a short walk away. Our party of 4 adults stayed for 3 nights, and found the apartment delightful. All rooms were well furnished and very clean. We loved the light-filled living room, and having separate shower and toilet rooms (each with a sink) worked well. Both the regular bed and sofa bed were very comfortable. The kitchen was well equipped and we appreciated Eleanor leaving fresh bread, coffee, and milk for us. It took us about 35 minutes to walk from the train station, not because of distance, but we got a bit confused by GoogleMap directions. But friendly neighbors helped us find the street. Eleanor was very prompt and helpful in showing us around the apartment and how the washer/dryer worked. The location was excellent: right behind Holyrood Palace. From the front door, it was a 2 minute walk to the end of the street, into Holyrood Park. And just a few more minutes to the Royal Mile. Eleanor's information pamphlet was also very helpful. There is a Sainsbury's grocery only 5 minutes walk, and the Safari Lounge (just before Sainsbury's) was fun for an evening drink.The neighborhood was safe for walking at all times. All 4 of us loved this apartment. Great job, Eleanor! All in all, in the sunshine there is nothing better than wandering around the streets soaking up the atmosphere. When it rains (which has been known!) you are never far from somewhere interesting to dash into out of the weather. Edinburgh boast a huge number of Art Galleries, Museums, theaters and live music venues as well as Cinema's, indoor shopping centers and entertainment Plaza's - something for everyone!